A lot of what this post talks about is “inside baseball”. Therefore I will attempt to explain what I know about these various scenarios. And I will admit that I haven’t set foot on an oilfield in decades. 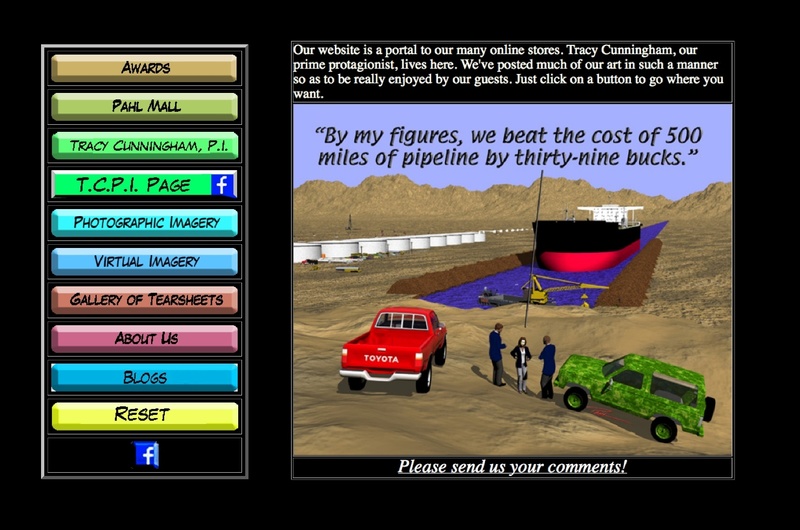 I created my oilfield from scratch, and detailed it as closely as possible. I had to make many of the mechanisms from what the 3D program called Bryce refers to as “primitives”. These are cubes, spheres, cones, pyramids, cylinders, flat squares and circles. With these elements, one can create almost anything in 3D. Unfortunately, Bryce is slowly phasing itself out, leastwise as far as Mac Computers are concerned. The three newest Mac OS 10 (7, 8, & 9) operating systems will not support Bryce. For me, losing a major part of my art-producing tools was a deal-breaker, until I resurrected my old 2009 mini-mac. The old guy uses OS 10.411, which does support Bryce quite well. So If you have a newer Mac and you want to delve into Bryce, you’ll need to install OS 10.6 or go on eBay and find a mac that uses an OS older than 10.7. Vehicles of all stripes are available on the web as freebies. You just gotta know where to find them. Planes, trains and automobiles can all be had for the asking. Some of these vehicles are quite detailed, some are too simplified to use as anything more than the distant cars in a parking lot. The biggest restriction is size. The way I make my dioramas takes space. I like things scaled to a pre-sized set of locked blocks. The other way to create a diorama is to size things so they look different distances from the camera. It’s the lazy way to do things. But if you do so, forget going anyplace else in the scene for different POVs. And that is the secret to my madness. Bryce will allow a “camera” to move to any point of view any place in the scene. For example, a helicopter’s POV… from inside a car, a truck cab … On the upper walkway on a drilling rig… I can go anywhere in my diorama and things will still be scaled. I keep these files of course, so if a thought strikes me that I need an oilfield, I’ve got one fully prepared. I have a seaside town, a working horse ranch, a mountain stream, a couple of military bases and a mountain cabin in winter. My old Mini Mac confuser gives up around 400MB file size. A closely detailed P eterbuilt can take 20MB by itself, mainly because there is a separate object for every lug-nut. So if you want to show a traffic jam, you’re gonna use a lot of megs.Thats where the elemental freebie cars come in handy. Some car “model” I have are a single element, with as much “weight” as one of those lug-nuts. You would figure a fairly detailed Burke Class Destroyer would take a ton more of weight-space than the truck. Not so. For example, no matter how big it is on screen, a tiny sphere uses the same amount of RAM as one sized big enough to encompass the entire oil field. Ergo, a detailed ship my have less parts than a detailed truck, because the truck model has a detailed undercarriage, whereas the destroyer has only deck detail and a three-segment hull. It’s a crazy world inside Bryce. But I like it there. Everything always seems to go my way. Let’s get back to the oil fields. There are plenty of opportunities for my kind of humor. For example the term “Whipstock” is used when a drill rig isn’t after oil directly beneath it. (For many possible reasons, like lack of ownership of the property over the oil pool, or rocky terrain, etc.) The driller goes after oil that may be displaced sideways several thousand yards. This is accomplished with engineers and slide rules, geologists and rock hammers, nerds and computers, someone named Merlin and a fair amount of magic. Next, let your imagination run wild. 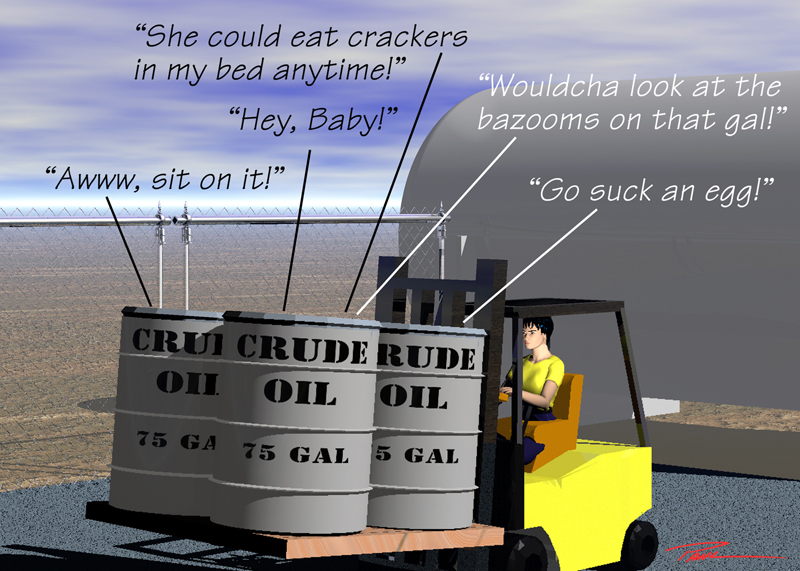 In my world, all you gotta do is figure out how to create a trench filled with water, go on the web and find a VLCC (Very Large Crude Carrier) to pick up the product five hundred miles inland. Ignore the mountain range in the background. Ignore the lack of a turning basin for the ship Appreciate the young female petroleum engineer. She saved the company thirty-nine bucks. Texas. We know two things about Texas. One, they have lots of oil. Two, they brag that everything in Texas is bigger , including their critters and bugs. We’ve all heard the term, “Texas-sized Mosquito”. One of the things you may notice about my cartoons… I like to put women in situations where you wouldn’t normally find them. Driving big rigs, and forklifts. Working as roughnecks. Even working as oilfield supervisors. A common entity found in oil fields are the mud loggers, or “loggers” These loggers have nothing to do with lumber. They are the places where magic occurs. They drop things on strings down the hole. Loggers, (people who keep logs on what’s going on in the well), employ “sniffers,” devices that smell and analyze the mud returning from the well. (A special mud is used as a lubricant inside the hole) They also send a probe down into the well to find out where the various levels of sand and rocks are. And finally, when its time, they can send down a string of shaped charges to blast holes in the concrete that has been pumped into the area where the goodies are, to prevent the well from collapsing inward. I learned a lot by going with my father to his various wildcat wells. He and several investors would stake a guy who was known as “Dry Hole Holmes”. Why these scions of medicine and industry … all of who had too much money and zero experience in wild-catting … didn’t get a clue from his moniker, rational people will never know. I really appreciate experiences in my youth that makes it easy to have my own working oil field. (Something that never happened in real life) in my own little world, you can find it a few kilometers east of my navy resupply base.